How does the MX filtering service work? The MX SPFBL filtering service eliminates SPAM even before it reaches your network. This is possible by changing your domain’s DNS records, causing the emails to be forwarded to the SPFBL servers and then forwarded to your MTA. In this way, SPFBL servers eliminate unwanted e-mail and only transmit legitimate e-mail. The SPFBL system uses the only Brazilian spam list (DNSBL), which is updated through the contribution of thousands of users using P2P technology. Allied to intelligent algorithms presents a very low false positive index. 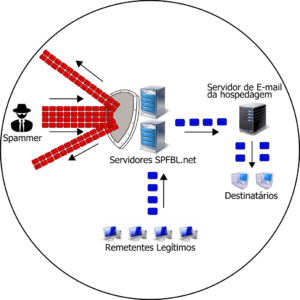 In this way, SPFBL servers eliminate unwanted e-mails and only transmit legitimate e-mails. I have an email Gmail, Yahoo, Hotmail, etc ... Can I hire the SPFBL service? The SPFBL service works only for companies or individuals who have their own domain. Unfortunately, it is not yet possible to use the service on freemail platforms such as Google, Yahoo, Hotmail, etc. I am a hosting provider, can I resell the service to my clients? Yes, you can offer the best anti spam service to your customers. We have special conditions for resales. Remove all data flow with unwanted emails from your infrastructure and treat only valid emails. Enter contact with us telling us the number of accounts and domains you want to filter. How do I know if the filtering is working the right way? We provide a web tool for the postmaster of each domain. On this page he can view all emails that have been fired against his email accounts. The report, in addition to displaying all blocked and delivered emails, allows the blocking and unblocking of any sender. How do I check the reputation of a domain? What is the cost of MX filtering service? How much does it cost not to be bothered with unwanted emails? How much does it cost to eliminate the risks of receiving viruses or having stolen information, such as bank passwords? Contact with us and find out that the cost of our service is minimal when compared to the benefits and security it provides for you. After hired, how long does it take for the service to be activated? Do I need to install any programs? After joining the MX SPFBL filtering service, it is activated in minutes. No need to install any program, just make a small change in the mx registry of your DNS and you’re done. Our servers now receive all your emails, only releasing valid messages and blocking all spam. Contact us and get the ultimate solution against spam. Access all the documentation about the SPFBL project and our DNSBL. Support 24h through our communication channels. Filtering service available 24 hours a day, 7 days a week.